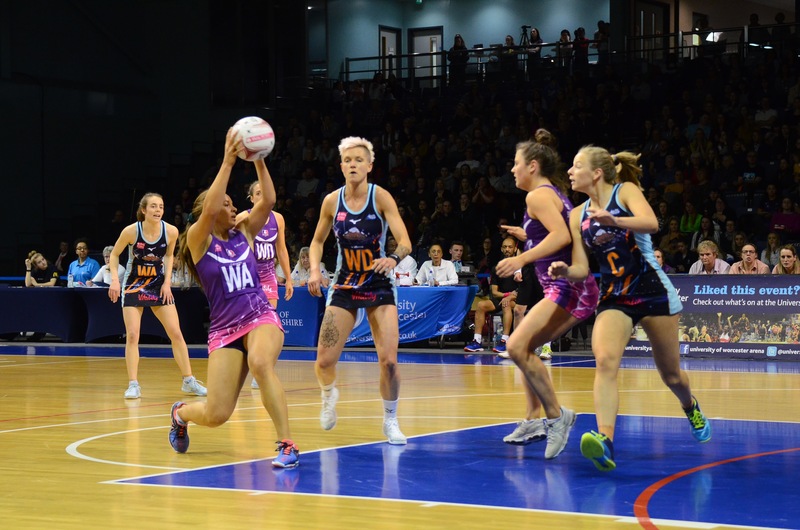 Severn Stars’ Head Coach, Sam Bird, praised the “outstanding” performance of her team as they narrowly lost 53-54 to high-flying Loughborough Lightning by a goal in the dying seconds of the game. Stars were level with their Midlands rivals with two minutes to go at the University of Worcester Arena after an exciting fourth quarter comeback, showing great strength to claw back an eight-goal deficit. But Lightning intercepted the ball with just 20-seconds left to go in the game, allowing them to transition quick up-court and score the winning goal. Stars had stormed to an early 3-1 lead, after a lovely feed into the circle from wing attack, Iona Darroch, found shooter, Georgia Rowe. But it was not long before the away side found their feet, as Hannah Josephs connected well with goal shooter, Mary Cholhok, to level the game, 7-7. Stars’ defender, Sam Cook, made two consecutive defensive stops, which allowed Stars to regain their feet. Cook and fellow Stars defenders, Jodi-Ann Ward and Becky Oatley, continued to impress allowing Stars to edge ahead 11-8. Stars looked to neutralise the pressure that Lightning were inflicting in attack, but ended the first quarter behind, 14-16. Lightning scored four consecutive goals without response at the start of the second quarter, but a beautiful interchange between Darroch and shooter, Maryka Holtzhausen, allowed Stars to add another to their tally. Cook produced another fantastic defensive stop at the other end and Stars capitalised, scoring two quick-fire goals, bringing the score to 20-22. But Lightning were able to keep their neck in front thanks to Jess Shaw, who continued to pull the strings in attack, leading 27-32 at half-time. After a flying third quarter start by Lightning, Stars rang the changes as Darroch and Harris swapped positions. But Lightning continued to pressure, extending their lead to 10. Defender Oatley responded by finding Rowe with a beautiful long range pass. This ignited the Stars attack and they reduced the deficit, ending the quarter 39-47 behind. Stars began a fourth quarter comeback, as wing attack, Darroch, found Rowe with a stunning ball into the circle. The home side pressed on, reducing the gap, and the crowd in the Arena roared as Cook tipped Cholhok’s shot, allowing Stars to quickly transition down court and reduce the deficit to three. Ward produced a critical interception preventing Lightning from taking the game away from Stars and Holtzhausen scored two quick-fire goals to level the game at 52 all. Rowe showed great composure as she put her team ahead by one goal with a minute left. It was a frantic final minute as Lightning levelled, before stealing the ball in the dying seconds. They closed out the game on the buzzer with a composed shot for the 54-53 win. Stars now have a quick turnaround ahead of their next game against Team Bath on Monday (25 March). Bird said: “It’s all about how we recover now. Bath have had one extra day recovery than us as they played yesterday.